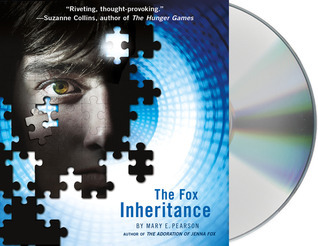 I wrote a book review for The Fox Inheritance just a month ago. You can read that below. All of the things I wrote then I can say again with the audio review so I will leave it in tact. However, there will be additional information about listening to the audio version at the end. I have never read a book and then just a few weeks later listened to the audio. I enjoyed reading the ARC so much that when asked to review the audio version, I happily said yes. I have to admit - I missed some things while reading the first time around! I missed the depth of Locke's despair while being lost in his own darkness without a body. I missed Locke's desperation to find Jenna - and to find her before Kara does. I particularly enjoyed the ending chapters where Lock and Jenna get acquainted and we listen to the two talk about who they are and what comes next. The actor, Matthew Brown, didn't have a particularly young voice, but he was enjoyable to listen to. I must admit, Lock, Jenna, and Kara are all from Boston. Now, I know you Bostonians have wicked awesome accents! Locke had no accent and I noticed that right away. Darn. Is the missing accent an effect of Dr. Gatsboro's changes/editions? Hmmm, maybe. I will say, I enjoyed Brown's take on Dot - my favorite character! He didn't have an overly dramatic robot voice and I appreciated that. Dot had a perfectly even, monotone sound that was just right. Nailed it. Overall, an excellent audio. It would have been even more delightful to have Jenna Lamia reprise her voice as Jenna Fox. Regardless, a great addition to any audio collection!